This is a fascinating read, with appeal for older kids and teens as well as adults. It has great potential for classroom use, perhaps paired with Ellen Klages' The Green Glass Sea. MacMillan even has a Teacher's Guide (.pdf) already prepared with pointers to the Common Core State Standards. 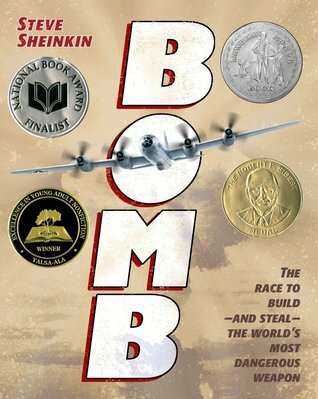 Also check out the post at Reading to the Core, which says of Bomb, "This is the kind of book you could build an entire curriculum around." Suggestions for how to begin to do so are included, of course. Don't limit this book to the classroom, though. After all, who could resist a true story of international spies and "the World's Most Dangerous Weapon"? Recommend to: Older kids and teens (and adults) who would like a "true story" that reads like a spy thriller.